An earthquake can strike without warning and wreak horrific destruction and death, whether it’s the cataclysmic 2008 Sichuan quake in China that killed tens of thousands or a future great earthquake on the San Andreas Fault in California, which scientists know is inevitable. Yet despite rapid advances in earthquake science, seismologists still can’t predict when the Big One will hit. 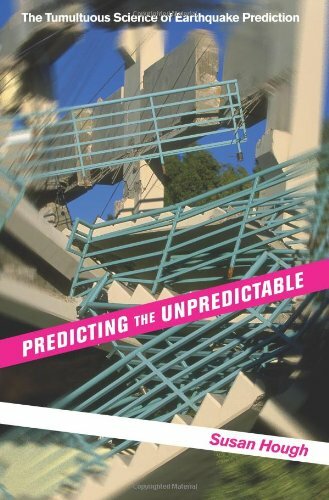 Predicting the Unpredictable is the first book to explain why, exploring the fact and fiction behind the science—and pseudoscience—of earthquake prediction. Susan Hough traces the continuing quest by seismologists to forecast the time, location, and magnitude of future quakes—a quest fraught with controversies, spectacular failures, and occasional apparent successes. She brings readers into the laboratory and out into the field with the pioneers who have sought to develop reliable methods based on observable phenomena such as small earthquake patterns and electromagnetic signals. Hough describes attempts that have raised hopes only to collapse under scrutiny, as well as approaches that seem to hold future promise. She recounts stories of strange occurrences preceding massive quakes, such as changes in well water levels and mysterious ground fogs. She also ventures to the fringes of pseudoscience to consider ideas outside the scientific mainstream, from the enduring belief that animals can sense impending earthquakes to amateur YouTube videos purporting to show earthquake lights prior to large quakes. This book is an entertaining and accessible foray into the world of earthquake prediction, one that illuminates the unique challenges of predicting the unpredictable.